The LEAF Marque team will be writing about current issues related to assurance schemes, as well as keeping you updated on everything going on with the LEAF Marque in events, training and retail. The results of independent research into the added value of LEAF Marque certification were released last week. The study, commissioned by LEAF and carried out by CCRI (The Countryside and Community Research Institute), reveals that LEAF Marque certification can offer significant financial, environmental and social benefits for farm businesses both in the UK and overseas. Kathryn Green, LEAF Sustainability Manager, explains more. The provision of robust, transparent and independent evaluation to support the claims we make about the benefits of LEAF Marque certification, are a vital part of our continual improvement. This new study, carried out by The Countryside and Community Research Institute (CCRI), showed that for many businesses the value of participating in the LEAF Marque assurance system reached beyond their initial motivations for joining, which were predominantly financial, and helped them develop their businesses in ways they had not previously considered. 97% of those surveyed reported that LEAF Marque certification had helped secure access to new market opportunities, with 23% reporting receiving a price premium for their LEAF Marque certified product. LEAF Marque certification was also reported to help farms qualify for other income streams, such as agri-environmental schemes. 36% of participants reported significant extra income as a result of being LEAF Marque certified. 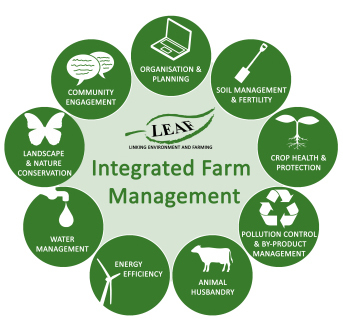 Focusing on LEAF’s Integrated Farm Management principles, which underpin the LEAF Marque Standard, was also shown to make operations more efficient in areas such as energy, soil, biodiversity, water and crop health. In energy efficiency, for example, more than half of participants reported making savings of between £10,000 and £17,000 per year. 66% of farmers who took part in the study reported increased biodiversity with many noting marked improvements in observed farmland birds, insects and mammals. 71% reported improved relationships with the public from being LEAF Marque certified, through hosting farm visits, maintaining footpaths and having a strong social media presence. An improved engagement with the wider agricultural sector was also reported by 47% of participants. Participants were unanimous in their support for the way LEAF promotes public engagement with many seeing this as of strategic importance for their business. The study also supports LEAF’s ongoing commitment to adhere to ISEAL’s (International Social and Environmental Accreditation and Labelling) Codes of Good Practice. As a Full Member of the ISEAL Alliance, we are committed to systematically monitoring, researching and reporting on the outcomes of the LEAF Marque assurance system. LEAF’s monitoring and evaluation programme helps inform stakeholders and drive change and improvement. These are very encouraging results which clearly show that LEAF Marque certification is delivering tangible economic, environmental and social benefits to farm businesses. All the participants in the study found value in being LEAF Marque certified. The attention to detail required in implementing LEAF’s Integrated Farm Management principles, which underpin the LEAF Marque Standard, is empowering farmers to make positive changes towards more sustainable farming. The provision of robust, independent studies of this type allow us to evaluate the impact of LEAF Marque certification and ensure that it continues to deliver meaningful benefits to growers and consumers alike. The results of this research clearly indicate we are heading in the right direction. We will build on the findings and look to extend the reach and impact of LEAF Marque certification across the globe. We are brilliantly placed to inspire and empower farmers on their journey to more sustainable farming and look forward to continuing to help them do it. Paul Hayward, farms Cold Harbour Farm, at Bishop Burton, East Yorkshire and was one of the first LEAF Demonstration Farms, engaging people with Integrated Farm Management since 1993, soon after LEAF was founded. Paul recently took part in an EISA (European Initiative for Sustainable Development in Agriculture) visit to Germany and here he tells us more about what he saw and learnt. Last month, I was privileged to join the EISA visit to Germany as an observer for LEAF along with Patrick Wrixon (LEAF Board member) and Nick Tilt (LEAF Demonstration Farmer). The whole event was perfectly organised by Andreas Frangenberg and Anton Kraus from EISA. We attended the DLG field day, an event targeted at crop production professionals, of note it was targeted at the top 20% of farmers. The following link gives a very accurate resume of the visit. It was a fascinating visit with some excellent and very informative presentations and I left wanting to explore the issues much further. Representatives from the agrochemical companies seemed to position the farmers as requiring a complete production package including biodiversity rather than recognising them as land managers with good knowledge. We were privileged to be joined by Professor Olaf Christen (agronomy and organic farming) of Halle University, obviously a talented academic with a good practical understanding of European crop production. The following day we were given a guided tour of the BASF Biodiversity Farm at Quellenhof by Dr Markius Gerber. A project started in 2012 on the 10, 600 hectare farm which had lost much of its natural habitats in the East German era. Work on a range of measures had started with some impressive results. However, with fields of 250 hectares, there is much still to do. The group enjoyed a wide range of discussions, benefitting from the diversity of the area and the interests of individuals within the group. We’re pleased to announce that we’ve become associate members of ISEAL! You may not have heard of ISEAL before, so here to explain what ISEAL is and why we are very proud to become an associate member is Jeremy Boxall, our Commercial Manager. Since 2003, LEAF has been setting standards known as the LEAF Marque, which represent sustainable farming. If the farm meets the standard then they are certified, this is certification. But the LEAF Marque is about much more than just certification. ISEAL membership to us, is like certification to a farmer. If you’re a farmer and your farm is LEAF Marque certified it has to be up to the standard. ISEAL drives us to make our standards systems up to the mark, in the same way our standards drive farm businesses to be more sustainable. In essence, it is about continuous improvement, so as new associate members, we’re working towards ISEAL’s Codes. Sustainability – Standards scheme owners clearly define and communicate their sustainability objectives and approach to achieving them. They make decisions that best advance these objectives. Improvement – Standards scheme owners seek to understand their impacts and measure and demonstrate progress towards their intended outcomes. They regularly integrate learning and encourage innovation to increase benefits to people and the environment. Relevance – Standards are fit for purpose. They address the most significant sustainability impacts of a product, process, business or service; only include requirements that contribute to their objectives; reflect best scientific understanding and relevant international norms; and are adapted where necessary to local conditions. Rigour – All components of a standards system are structured to deliver quality outcomes. In particular, standards are set at a performance level that results in measurable progress towards the scheme’s sustainability objectives, while assessments of compliance provide an accurate picture of whether an entity meets the standard’s requirements. Engagement – Standard-setters engage a balanced and representative group of stakeholders in standards development. Standards systems provide meaningful and accessible opportunities to participate in governance, assurance and monitoring and evaluation. They empower stakeholders with fair mechanisms to resolve complaints. Impartiality – Standards systems identify and mitigate conflicts of interest throughout their operations, particularly in the assurance process and in governance. Transparency, accessibility and balanced representation contribute to impartiality. Transparency – Standards systems make relevant information freely available about the development and content of the standard, how the system is governed, who is evaluated and under what process, impact information and the various ways in which stakeholders can engage. Accessibility – To reduce barriers to implementation, standards systems minimise costs and overly burdensome requirements. They facilitate access to information about meeting the standard, training, and financial resources to build capacity throughout supply chains and for actors within the standards system. Truthfulness – Claims and communications made by actors within standards systems and by certified entities about the benefits or impacts that derive from the system or from the purchase or use of a certified product or service are verifiable, not misleading, and enable an informed choice. Efficiency – Standards systems refer to or collaborate with other credible schemes to improve consistency and efficiency in standards content and operating practices. They improve their viability through the application of sound revenue models and organisational management strategies. This all ensures that we’re going in the right direction and that the work we do has the maximum impact. It’s not just certification. Huw Rowlands farms at Grange Farm, Mickle Trafford. Here he tells us of his journey to becoming LEAF Marque certified and how it has affected the way he farms now. Here at The Grange Farm in Mickle Trafford we run Red Poll cattle as a single suckler herd, producing top quality beef which we wholesale to local pubs and restaurants and to Williamsons Butchers in Waterloo, Liverpool, and retail from the farm and at various farmers markets. It’s a far cry from eight years ago when the farm was losing money on milk and was home to a herd of Friesian cattle. The farm is in both Entry Level and Higher Level Stewardship with Educational Access, and we host around sixty visits a year including taking part in Open Farm Sunday and Heritage Open Days, and are heavily involved with the Cheshire Wildlife Trust’s Gowy Connect Project. We grow small areas of low input spring barley, game cover crop and pollen and nectar mix as part of our Stewardship Scheme, and have ten hectares of poplar plantations for commercial use. Perhaps the main change has been the philosophy of how we farm. Rather than working against the land, we now work with it. In 2009 we stopped using manufactured fertilisers, partly because of cost, but mainly because we had discovered that our soils were degraded, and this was contributing to major problems with the health of our Red Poll herd. We now use a small amount of treated sewage cake and a vast quantity of green compost from Waste Recycling Group at the nearby Gowy Landfill Site. Being fairly extensive, the next logical step was to consider becoming fully organic, but we were prevented from doing so by two factors. One was the use of sewage cake, and the other was that we would have had to send cattle for slaughter at an organically accredited abattoir, with the nearest being at Uttoxeter (60 miles away) or on Anglesey (80 miles away). This would have led us to having to charge more for lower quality beef from more stressed animals which had travelled further to be killed. We were also concerned about the environmental impact of the increase in extra fuel which this would have entailed. Red Poll Steers on the moove! So LEAF Marque accreditation seemed ideal, and we went for it and gained it for the first time in February 2011. LEAF Marque has been a huge benefit in terms of publicity and marketing to the extent that we are now struggling to meet the demand for our Red Poll beef. It is a guarantee to our customers that we are managing the land in a sustainable way and caring for our cattle to the highest standards. The rigorous annual audit helps to ensure that good intentions are put into practice, and being in LEAF Marque is helping us to save money by encouraging, for example, rainwater harvesting and reduced fuel use. Do I really need to use a tractor and trailer, or could I just do the job with a wheelbarrow?! It may seem a big step to take, but I urge livestock farmers to look at joining the growing ranks of LEAF Marque producers. You will find you can both save money and command a premium price for what you work so hard to produce. And, as importantly, it is immensely satisfying seeing the increase in biodiversity on the farm year by year. Remember back in April, we called for wildlife-friendly farmers to enter the RSPB Telegraph Nature of Farming Awards? The voting period for this year’s RSPB Telegraph Nature of Farming Award is well underway, with four farmers vying for the top spot as the UK’s most wildlife-friendly farmer. There’s only a hare’s whisker separating them, so we are all on tenterhooks watching the votes come in. Will the overall winner be the Jess Ennis of 2012, leading all the way, or is there a Mo Farah biding his time to take the lead at the crucial moment? Funded by the EU LIFE+ Programme, the Nature of Farming Award is the largest farmland wildlife competition in the UK, and along with our partners at Plantlife and Butterfly Conservation, it gives us a chance to celebrate the farmers that are making our countryside a better place. I’ve been lucky enough to visit one of the farms in the final and was utterly inspired by the work going on there, and the passion and dedication of the farmer. But I’ve also spoken to colleagues who have worked with each of the other finalists, and I know the same is true for them all! These farmers are a real inspiration for what can be achieved, and I’m quite glad that I don’t have to make the final decision about the overall winner! That’s down to you and the thousands of others who vote to show their support for farmers who provide for wildlife at the same time as running profitable businesses. You can show your support for the vital role that farming plays in conservation by voting – to help you make up your mind, listen to what the finalists have to say on our Nature’s Voice podcast. Voting closes on 5 September 2012 and by voting you will be in with a chance of winning a luxury break for 2 at Ragdale Hall. 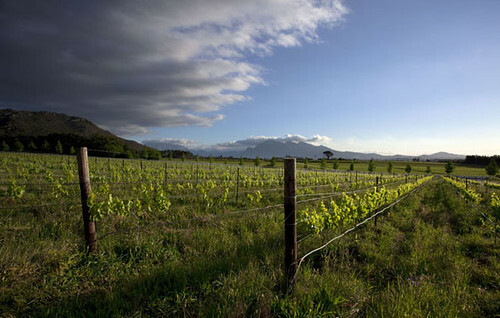 Avondale is a family owned and family run South African wine farm located near Paarl in the spectacular Western Cape. The farm has been under cultivation for more than 300 years and prides itself in producing fine wines with care for the environment, using holistic farming methods. Avondale have won numerous awards in recognition of their commitment to environmentally sensitive farming and were the first wine producers in South Africa to become LEAF Marque certified. 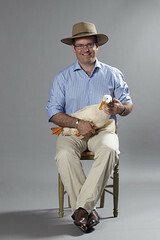 Here, we chat to Jonathan Grieve, Proprietor about wine, weather, water and ducks! How did it all begin and what inspires you? My family bought the estate in 1996 and at that stage it was very run down and farmed conventionally. I started working on Avondale in 1999 fresh out of studying fine art, I soon become aware that the conventional methods where not working as they preached. So I started to look at alternatives which lead me back to the natural way. As they say the rest is history and that was the start of our system that we call BioLOGIC®. Avondale were one of the first South African wine producers to be awarded the ‘Biodiversity in Wine’ certification – what’s the secret of your success? Well our approach to production is quite simple, we always ask the question; “Does Mother Nature approve?”, if the answer is yes then we are happy if no, we need to go back to the drawing board. We want a living natural self-sustaining system which only comes from a holistic approach. One of the main reasons is that we sell our wines and fruit in the UK market and naturally with all the initiatives that Avondale has in place LEAF made sense from an external audited standard. This way we can talk about what we do and it’s also externally validated. You pride yourselves in taking a more environmentally-friendly, holistic approach to wine production. What role does LEAF and Integrated Farm Management play at Avondale? Well we believe our BioLOGIC® system goes a lot further than any conventional standard requires, we do every thing from nurturing the smallest bacteria in the soil, through to the largest animal we have on Avondale. It’s a true holistic approach; of course LEAF and IFM have certain structures that bring different aspects into focus from a managerial perspective which is very positive. You have developed your own unique approach to viticulture called ‘BioLOGIC®’ – what’s it all about? You practice slow wine making – what is it and why? Well it’s all about firstly producing the best possible grapes full of flavour and expression of place and then the wine making needs to take this raw material and get it into the bottle and to the customer. We believe the only way to do this is in the natural slow wine making principles. So we make use of only natural fermentations with almost no additives (No acid, sugar, enzymes yeast etc.) We do much more warmer fermentations and because of the natural fermentations some of the wines can take up to six months to ferment. But this is really where all the flavour and mouth feel comes from. At the end we want to produce wines that are very expressive from where they come from, not “Factory made”! Wines that express the soils, the climate and the place they are made, so when one of our customers open a bottle of Avondale it’s unlike anything else. That’s why we do it! We produce extraordinary wines approved by Mother Nature! Your ethos is Terra Est Vita, which means ‘Soil is Life’ – what does this mean in practice at Avondale? Well it’s the base of everything, if you don’t have a living soil you will not have a living farm. So we start with a very integrated soil balancing system to “restock the pantry” from a natural broad spectrum nutrient perspective. This is because through broad spectrum nutrition you get plant heath less decease, less weed competition and ultimately a living as nature intended. Of course we use no chemicals at all on Avondale. We also have a very integrated cover cropping system that we grow diverse mixes of crops throughout the year in the vines and orchards which chief goal is to feed the natural soil food web. Of course it also does a lot of other beneficial things such as nitrogen binding through legumes, natural tillage, erosion control and provides an environment for all the natural predators etc. to be in the soil and vineyard. You control pests and diseases using natural methods. Can you tell us more about your approach and your famous duck posse?! At Avondale we mimic the ways that Nature supports natural predators in the system so as to curb disease and regulate infestations. At the micro-level we make use of two strains of beneficial bacteria to combat downy mildew and harmful worms. When necessary, we release the predatory wasp known as the mealy bug destroyer to combat attacks by mealy bugs. 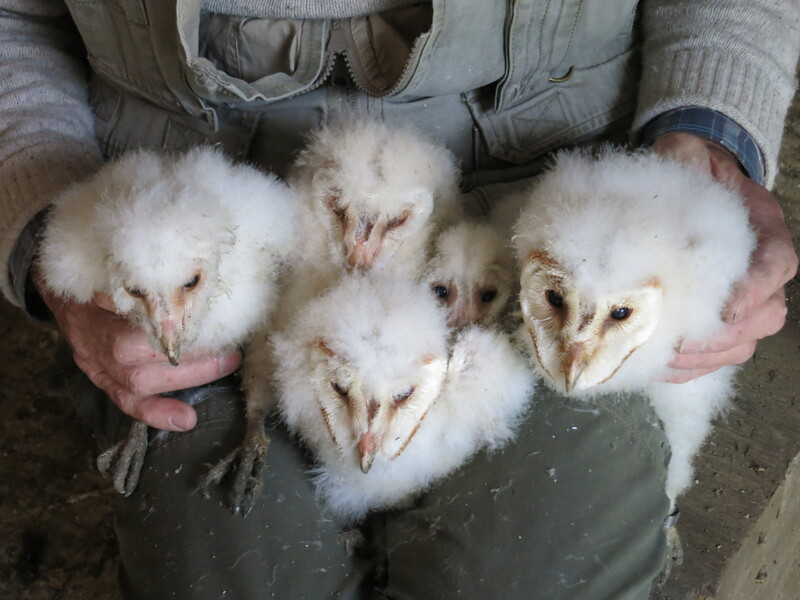 On the larger scale, Spotted Eagle Owls, Rock Kestrels, Yellow-billed and Black-shouldered Kites occur naturally on the farm and we have encouraged these birds of prey to do their work of rodent control where we need it most by erecting tall poles for convenient perching and owl houses in the vineyards. Perhaps the most picturesque of our natural pest management methods is the employment of a posse of glossy white Pekin ducks who range through green vineyards on snail patrol. 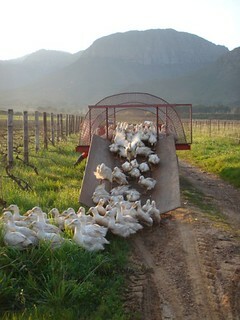 These ducks are entrained from young to voluntarily gather in the custom-made ‘duck-mobile’ and go out each weekday to do their work. Happily, they waddle between the vines and forage in the cover crops for snails. They are a highly effective and cost-efficient team who protect us from the damage that snails can do without having to resort to poisonous bait or the organically approved substitutes for snail control. We have learnt from Nature that there are always better alternatives and we are constantly seeking new ways to strengthen the ecosystem as a whole, such as our current investigations into being an attractive environment for bats which do great work at moth control. LEAF Marque Technical Manager, Anthony Goggin, recently travelled to Senegal as part of the FRICH project. Here he tells us all about his trip. There’s no doubt that LEAF principles travel very well indeed. I saw this first hand in sunny Senegal in North West Africa recently, a country which is fast becoming a very important exporter of quality fresh produce to Europe. After an overnight stay in Senegal’s capital, Dakar, it was a 4 hour drive up to St Louis the next morning. Known as the ‘Venice of Africa’ for being built on a collection of islands, St Louis has markets brimming with fruits such as melons. Just inland, in the flat land south of the River Senegal, is the 100 hectare farm managed by Soldive, a French-based company that grows melons in Europe, the Caribbean and Africa. I met with the Soldive’s Technical Manager, Lionel Payen and his Senegalese colleague and Production Manager, Mohammed Gaye. Together they manage planting the crop in the field, weeks of precise fertigation and careful agronomy through to harvesting and pack-house operations ready for shipping to Europe in just eight days. I was able to see first hand the care they take at each stage of production and their commitment to the highest standards. The melon business provides much needed employment and the canal that brings water from the Senegal river to the melon fields also brings water to the community which means they can now grow their own crops nearby. I saw plots bursting with chilli peppers, tomatoes, onions and peanuts. These West African farmers, just like those I met in Kenya last year, were very interested to know more about the principles of Integrated Farm Management (IFM) and to hear about it in action in the UK and other parts of the world. I was able to show the African IFM films that have been developed through the FRICH project we are involved in. 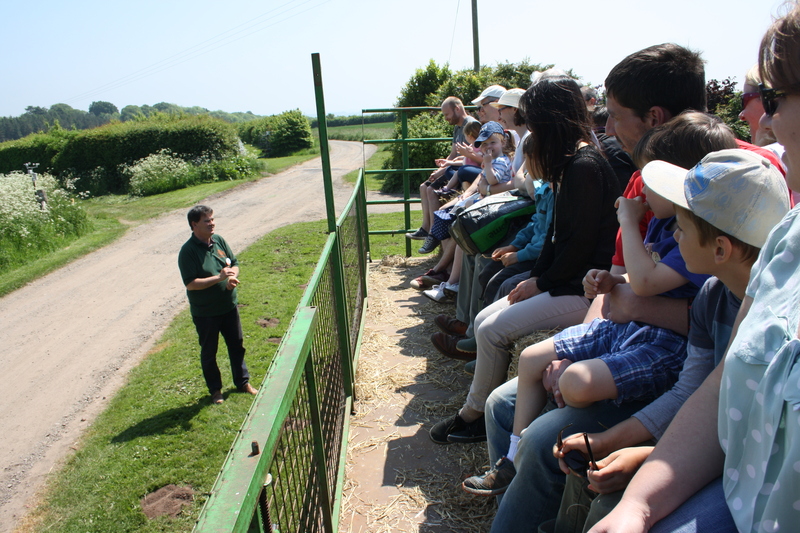 As in the UK, there’s nothing like a farm walk to really get discussions going. I took the Soldive team to visit a Senegalese farm in the same area that has already adopted LEAF’s Integrated Farm Management and had their farm certified to the LEAF Marque Standard. The farm is named SCL, part owned by UK’s Barfoots of Botley, and we had a good few hours walking through their crops of sweetcorn, asparagus and sweet potato. 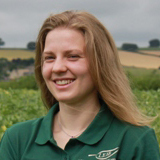 We heard from Celine Frouin, Head of Agronomy at SCL, about why and how she farms the LEAF way. You can hear more about LEAF’s work in Africa in our series of podcasts, produced for the project, here. More about this FRICH project and others can be found on the DfiD website. The Rago family have been working their farm for over a hundred years. Combining traditional methods with the very latest modern technology, Rago epitomise sustainable farming. Growing baby leaf products and other salad crops in Battipaglia, Southern Italy. They are one of the largest exporters of Rucola (wild rocket) in Europe and the largest Italian grower of organic baby leaf. Rago joined LEAF in 2008 and became the first LEAF Marque certified farm in southern Italy in 2010. We caught up with Rago’s Michael Earley to get a fresh perspective on sustainable salad production in Italy. Rago has been running for 119 years, that’s a long time! What’s the secret to your success over the years? It all boils down to one thing. Anyone, anywhere on the farm can halt production or stop a shipment. Quality has always been of paramount importance to the family. Our products have our family name on them. We like to say, “It’s not business, it’s personal”. How important is sustainable water use in Italy in general and to salad growers, in particular? How do Rago manage their water efficiently? We are very fortunate that we have a very safe, secure water source. While most of the surrounding farms draw their water from close to the surface, we have a 125 metre deep well that was drilled through semi-permeable volcanic rock. We grow all our salads under tunnels, so we capture all the rain water and distribute it to other local growers in the area who use it for irrigation. Wildlife is an important and valuable part of any farm. 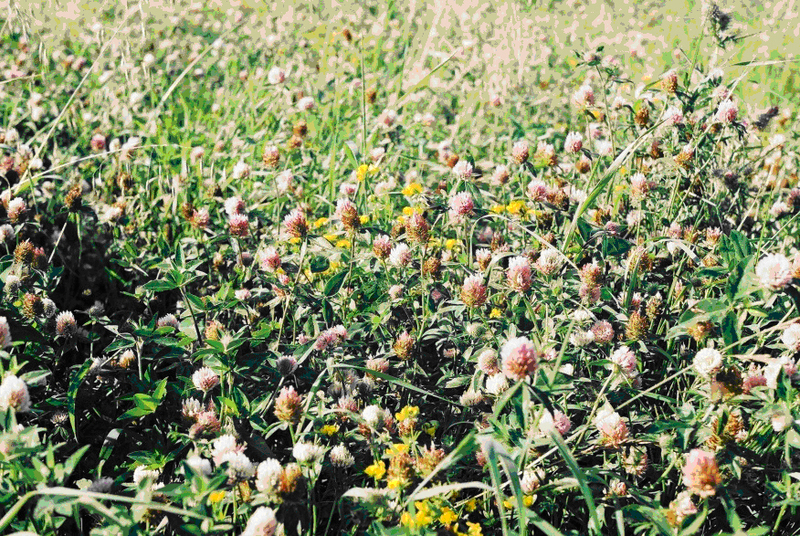 What measures are you taking to sustain and improve wildlife populations on your farm? Wildlife is very important to us. We work very closely with local conservation and bird groups. We have installed many bird and bat houses of a variety of sizes for a very wide range of species. We have an ornithologist who visits us during each season to survey the farm and make suggestions on different habitats and ground covers. Throughout the farm we have installed many display boards with images and descriptions of the bird’s common to areas of the farm, for both workers and visitors. You say that you are using the most cutting edge technology on your farm, often before anyone else has even read about it! What kind of technology are you using and what does the future hold for Rago and the industry? We work closely with Italian manufactures in the design and testing of new equipment. We also work with local universities to study new species and growing procedures and have recently customized our drills to develop a new method of planting that has reduced problems with mould. In the pack house we have a wide array of new factory machines that are not yet on the market. Many of the UK’s largest pack houses have come to see our equipment and have begun to install larger versions in their faculties. How has becoming LEAF Marque certified helped your business? Being LEAF Marque certified has been very important to the business. It is seen as a benchmark for our environmental best practice. We have followed the ideals of LEAF for over a century. Our soil is black and rich, in contrast to our neighbours’, whose soil is grey or brown. Every summer we grow corn, sunflowers or beans which are turned into the soil improve organic content. We are always trying to give something back. We have taken care of our soil for over a hundred years and it has taken care of us as well. Many of our clients or potential clients are from the UK and knowing that we are a LEAF Marque certified farm shows that we are a cut above the rest! You export fantastic salads and vegetables all over Europe. Are all your customers’ demands and wishes the same? We supply many parts of Europe with our salads. The needs and wants are different in each place. The taste to the North and East goes to a more bitter flavour in salads, sweeter in the south. In Germany and the Netherlands they prefer their salads in punnets rather than bags so we have taken each region’s preferences into consideration when supplying to that area. What are the main things your customers want from their salads and vegetables? Do you see them changing? We are known as quality growers, first and foremost. Many of our customers have partnered with us because they know we provide safe and tasty products. We are very tight on our financial controls so we are able to keep our prices fair. With the ever increasing pressure on price from the supermarkets, we are finding more ways to cut cost without lowering quality. Images courtesy of Michael Earley. The Food Retail Industry Challenge Fund, also known as FRICH, is run by the Department for International Development (DFID) . The fund helps bring UK retailers and African farmers together to help improve the longer term prosperity of their farms . Our project is all about supporting African farmers to learn more about sustainable farming , improve their yields and increase the income they earn from their crops. We’ve been travelling to Kenya and offering practical training in soil and water management, energy use and crop protection. We’re also encouraging them to become LEAF Marque certified which will help them secure valuable contracts with UK retailers. 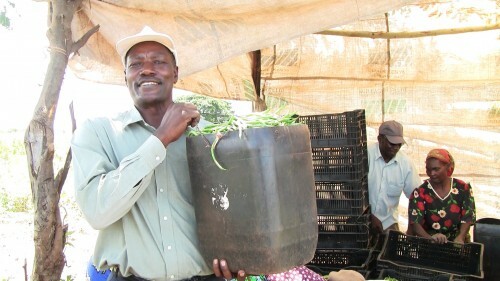 Green bean farming helps the community in lots of ways. In the past, the produce buyers were only interested in the quality and safety of the beans. But now, through our involvement with FRICH, we have a partnership with a European company and they’re really interested in the quality of the land and the life of the community, as well as the quality of the beans and peas. The FRICH project really addresses these issues and helps farmers to farm in a more sustainable way, whilst giving them the credentials that will help them secure and maintain contracts with retailers, which in turn, brings much needed resources back into the local community. It’s a project that we’re really proud to be involved in. Tagged Africa, Blue Skies, British & Brazilian, Food Retail Industry Challenge Fund, FRICH project, Green Shoots, LEAF (Linking Environment And Farming), LEAF Marque, Sunripe, Waitrose, Wealmoor.